The first thing I noticed straight away was the fantastic quality of the products. They feel and look so luxurious I was jealous that they weren't for my bedroom! Gracie was very excited about her new bedding and especially her new pretty cushion so she came upstairs to 'help' me make her bed. It's amazing how just a duvet set and cushion can really transform the look of a room. 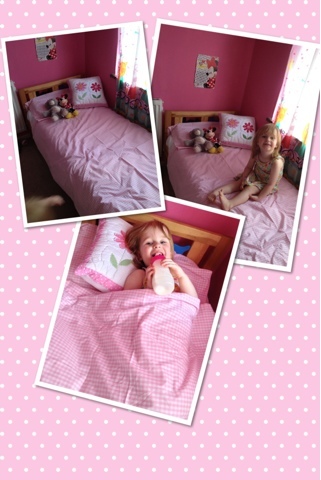 It looks so grown up and Gracie has been taking any visitors upstairs to show them her new 'big girl bed'. The products may not be the cheapest but they are the best quality I have ever owned. They are so pretty and girly and wash lovely which can be a problem with cheaper lower quality bedding. The Flower garden cushion comes with the cushion pad and the cover is fully removable making it easy to wash. The little details on the cushion are fantastic. It is hand quilted with embroidered and appliqued flower detailing and fastens on the back using small tie ribbons which I think is a lovely touch. I love that the pink gingham duvet set goes with anything and can never really be outgrown. Like I said before Zach's cot has kind of been neglected all he had was a fitted sheet and I would just use blankets to put over him but now that he is getting bigger he needs a nice quilt for his bed. 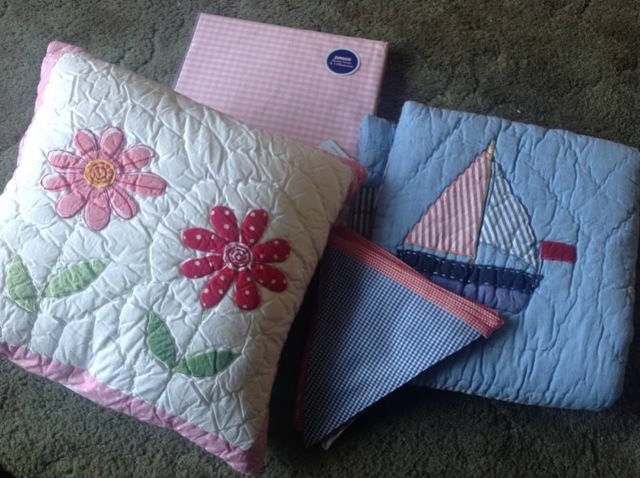 His boats cotbed quilt has the same quilted look as Gracie's flower garden cushion and I love how they both look and feel. 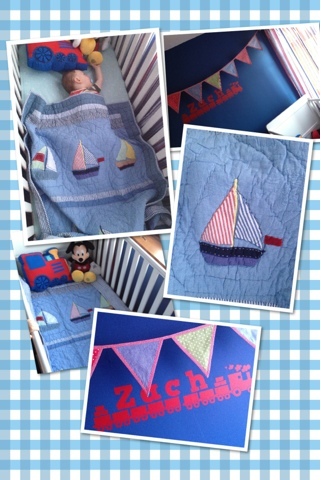 I also like how the quilt is not too big and bulky which is perfect for a baby in a cotbed. 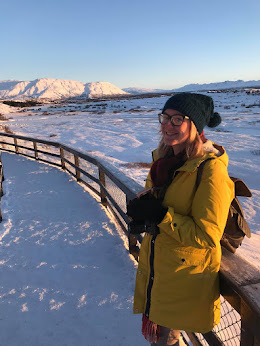 It's thick enough to keep warm in the colder weather but not so thick that they can't still be used in the summer. I think the sail boat design is fab too it's another design that will last years without being outgrown or looking 'babyish'. Zach seems to like it too he's been having much longer naps now in his cot in the daytime giving me some peace and quiet! The bunting is great too it's a lovely accessory perfect for finishing off a babies nursery. We placed ours on the wall above Zach's cot and as you can see in the picture it goes perfectly with the rest of the room. We were sent the products featured free of charge for review but all views and opinions are my own.